Aww. He still believes he was born on December 25. Calculate your new star sign. Whohoo!! I’m still a Sagittarius! I’m so happy Jesus didn’t become one of us. He would not fit our gang. I’m now a Gemini. Now i have to get rid of all my Cancer nick-nacks. Fortunaltely most of the horoscopes are based on our current seasons and have nothing to do with the Earth getting out of alignment with the 3,000 B.C. star chart! So lucky to be the same sign I always was!!!! Not the new snake guy thingie….. I remember reading an article on this same thing – 35 years ago. It was written by Isaac Asimov, and appeared as one of his monthly science columns in the Magazine of Fantasy and Science Fiction. don’t worry, jesus, you’re still a capricorn to the eastern orthodox! Funny: I don’t feel different. I was a Virgo, which I have never been too happy with. Not butch enough, I felt. A little wimpish I always thought. However, it appears I am now a Leo. Wowee. Well macho, eh? (Gives a little roar and exits stage right). 1. I like the sub-headline on the newspaper. 2. How come there’s no *bear* starsign, other than “the water BEARer”? As a Cancer you were good at BMX tricks. Cancer people are often boring. “Ignore the data, or change the belief”? 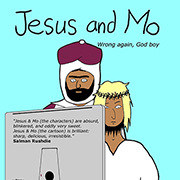 Well, I know heresy when I read it, and it seems like Mo is on that slippery slope we often hear about. Cus the suckers will keep coming back. The Xtians will have to deface the carved imagery on quite a few churches and Cathedrals now. Chartres, Autun and Amiens are all famous for their zodiac stone work, for example. Capricorn tends to be placed as the top symbol, due to the ‘code’ that identifies it with Jesus. They’ll have to chip out Chartres’ window and rotate it by 30 degrees, before grouting it back in and hoping no-one notices! Runar, I remember the Asimov article too, although I saw it reprinted in one of his numerous and excellent non-fiction books when I was in my first few high-school years. I tried to ‘convert’ my fellow students but hey, it was [an ultra-conservative] high school and nobody was really interested in learning anything. Okay — this one is a rare “stupid both ways”. It would be unsurprising if the time of year you were born in — which month — had significant effect on your personality and life IN AN AGRICULTURAL SOCIETY. Nutritional levels, early life events and so on would be at least impacted over the first year or two by where in the year you were born. Of course — there are almost no agricultural societies left. The social clock doesn’t depend on the seasons, but on the corporate accounting cycle. 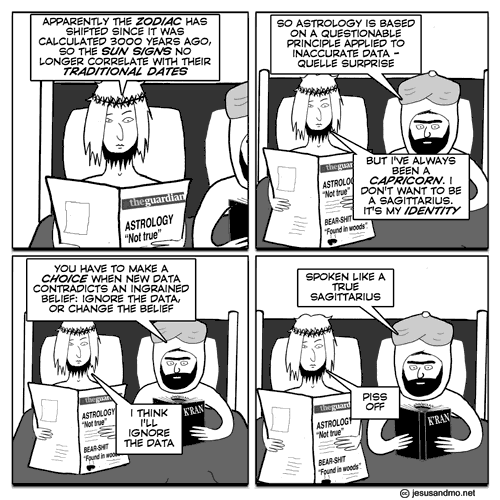 So, even if astrology was meaningful 500 years ago — it’s completely stupid now. What we need is a new “corporate zodiac” based off of where in the financial cycle you were born. Did Dad get a Christmas bonus? Was mom pissed because of end of the year audits? so, that would be a corpiac? It looks like the name of the Asimov book might be The Stars in Their Courses. I haven’t read that one, but luckily there is a local copy available by interlibrary loan. Thanks for the tip. The ancient Chaldean astronomers divided the sun’s apparent circular path around the earth into twelve sections (what modern astrologers call “houses”) of 30 degrees each. They fixed the start of the sun’s “year” at the Vernal Equinox, which in those days happened to be in the constellation of Aries. Hence the term “first point of Aries”, which refers to the sun’s position at the point when it crosses the celestial equator. The 12 divisions/houses were named after constellations convenient at the time. Astrologers work with the houses, not with constellations, so the effect of the precession of the equinoxes is not considered relevant. On the other hand, they do seem to impute to each house many of the characteristics associated with the names of the original constellations, and as this all dates from a particular time there is no reason to suppose that it has any authority other than tradition. So it’s rubbish, probably. So forget I said all this. Brilliant comic, by the way. So glad I discovered it. Please ignore all those people who want more animation. It’s perfect the way it is. I’m still a scorpio, which means I’m naturally sceptical and hung like a baboon.. I love the quotes round “not true”. Straight from the Guardian style guide. Scorpions are nasty things that should be stamped on. Prediction: you will be stamped on. Let me be the second (rats) to congratulate you on the well-deserved Riffy award! So the Riffy award for Best Comic was actually won by the best comic? What is the world coming to? Is there any prize money? Oh dear, I was born on a cusp. I’m not sure if that makes me a cuspidor or a bicuspid. Well what do you know? According to the ‘new star-sign’ site I used to be Capricorn and am now Saggyhairyarse. Trouble is, according to every book on astrology – and every newspaper / magazine horoscope I’ve ever seen – my birthday originallly made me Aquarius. You know that something’s nonsense when even a debunking site run by someone who once did it for a living can’t get it right! I used to be Ophiuchus but now I’m Reticulum (I blame the Zetas). That’s a shame, I always thought of myself as more of a Retarius or perhaps Gadolinium. Ophiucus: today you will make a hot drink which will cool perceptibly over time. You will move electrons and slightly warp space-time a bit. Your lucky colour will be blank and your fortunate number 7,738,857,756,638,904,943.6 . Watch out for beans, red dogs and things that tick. Cut the green wire. Don’t eat that.